Eggplant, come on. I want to love you. Every year we try, but it is so hard. Getting to be down right impossible. Guidelines/directions say to get eggplant started months before the frost free date. We dutifully comply, inside, under cover, babying, coddling, keeping temperatures warm. We do the same for tomatoes and peppers. Kinda similar, those summer loving plants that need to flower, bring on the pollinators, avoid the munching insects that enjoying turning leaves to lacy renditions of the former glorious and full version of the day before. They do just the same thing, stunting growth when too cold in spring, plain old shriveling up and turning to mush at the first fall chill. Remember, this spring when temperatures dropped into the low 40's in York and Harrisburg? When located as we are, here in a spot nicknamed "Bald Hill", just a hump or two over from Ski Roundtop, our temperatures are usually lower. So we scrambled, and covered your sensitive baby selfs with anything we could find: big cans, mason jars, hoops and floating row covers. Johanna was here and gathered every vessel we have, covering so many. Arranging the balance of containers out so I could get them over top. And the next day, when the sun came out and the temperature jumped? Especially under glass? And scrambling again, to uncover so you didn't get cooked to death. We did the same for all those pepper plants too. That was May. Like 90 days ago. We put down trickle hose. And weed protection. And have hand weeded. For M O N T Hs. 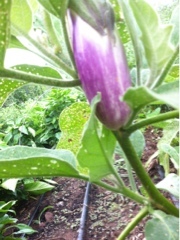 And there is one eggplant to pick today. ONE. One hundred plants planted, babied. And we have just one eggplant. Who gets it? We have 40 vegetable shares, which we truly thought 2.5 plants per share would cover nicely. As in 4-6 eggplants each week each share. One? Our hearts are breaking. Worse, the temperatures are cool and the weather is damp. 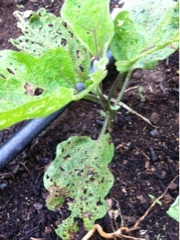 Not exactly conditions loved by eggplants in August. Where are all your little flowers, for our lovely honeybees and bumble bees and all the other pollinators buzzing around our chemical free farm? Not even making them, it appears. You are on notice eggplant. We are planting, in other beds, those cool weather loving vegetables like raab, cabbage, Brussel sprouts, even trying cauliflower. Cause the love is waning eggplant. It is slipping away. It's time for you to give back...or it might be time to be replaced with our dear, reliable stalwarts of spinach, Swiss chard and Tom Thumb lettuce. For now, we are trying to keep the love alive. But it is just about done dear eggplant.